What can you do in a few minutes? Now I can tell you. You can find the satellite TV signal and high-quality picture signal that you want. Are you crazy about the bad signal of football match channel and direct TV? Do not worry, our V8 finder gives you a perfect enjoyment. It can provide the strongest signal of football match channel and direct TV.just have it, you can watch many different TV shows or programs.if you install the satellite dish, then the V8 finder is the perfect match. -Lithium-ion 3000mA Battery :Normal work up to 4 hours. 1.【Enjoy FreeTV】: Freesat V8 can help you to enjoy many free channels.it can receive many satellites. Full HD DVB-S/S2 Complian, Fully DVB compliant,6000 channels TV and Radio programme.For example,the satellite name:EchoStar 16;SES 1;Galaxy 17,18; direcTV 14,8,4S...etc.You can enjoy many channels, like Dish USA,GEB America. CBN News,Sky Mexico etc.Our customers share so many video about how to use it. such as the link:https://youtu.be/49OZbW5O37I it will be so helpful to you. 2.【High Quality and Stable Performance】：It's with microprocessor controller, reliable and stable performance.3.5 inch LCD Colour Screen, Lithium-ion 3000mA Battery, Normal work up to 4 hours.Support AV in and AV/HDMI out function, battery power display, Support 13V / 18V / LOCK status panel LED display directly, Software Upgradeable via USB. 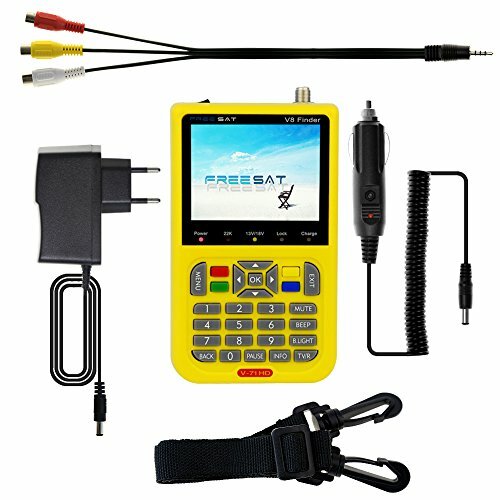 3.【Suitable for Novice】:It is a useful product for beginners and suitable for the adjustment and installation of dish.we add many North American satellite names in the machine, but for most users, they like to add many favorite satellite by themselves.With this finder, you can set and align a satellite dish quickly, easily and accurately. 4.【Its Functions in Life】:You do not need to carry the TV or a dish to connect with a long wire. If you have it, it will not waste your time,you can install your dish in the high floor freely. Besides, it is portable,so convenient to carry.Besides,It detects very faint signal.By the way, if it beeps, it is normal.because the beep is concerned with the strength of signal.Of course, you can go to the system to turn off it. 5.【What you Get】:A V8 finder digital satellite Meter; A AV cable;A car charger cable;Adaptor;Carrying bag;A Strap, Most importantly, we have reliable 12-month warranty and friendly customer service.Professional customer service is waiting for you. PS:Technical support website:www.freesat.cn. If you have any questions about this product by Xmore, contact us by completing and submitting the form below. If you are looking for a specif part number, please include it with your message.